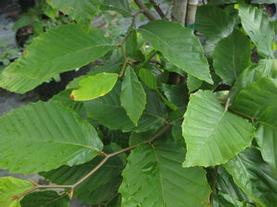 American Beech is one of our most stately native trees, and also one of the most problematic ones to transplant B&B. As a result, we are growing it in containers so everyone can have a chance to marvel at its beauty in their own landscape. The bark is beautiful all year, maintaining its silver-gray color throughout its lifespan. The summer leaves are a large and glossy dark green, often turning an attractive golden bronze in the fall. The juvenile beeches usually retain their foliage throughout the winter, turning to a soft whitish-tan after the fall. When Fagus grandifolia is mature enough to bear fertile nuts, it is a very important food source for birds and mammals. Narrow green leaves emerge from tan culms in late spring, adding to previous season's foliage. Vase-shaped, clumping, deer resistant and semi-evergreen. 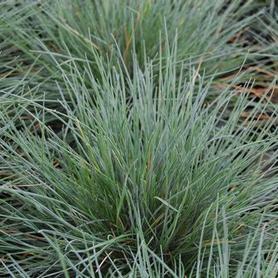 Beyond Blue™ Blue Fescue Grass is a lovely dwarf evergreen grass that thrives in partial shade. The needle like blades are icy blue all year, and are topped by numerous feathery blue seedheads in summer. As the inflorescences mature, they take on shades of tan and persist through the fall. Since Festuca Beyond Blue™ is evergreen and very compact, it makes an excellent addition to mixed containers for summer, fall and even winter enjoyment. It also is striking when used in masses in semi-shade areas. 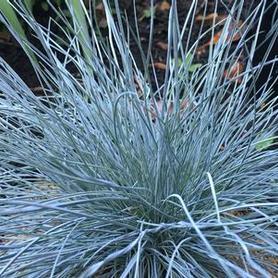 'Elijah Blue' Blue Fescue has short powder-blue foliage. It prefers cool weather and shady locations. Seedheads of Festuca glauca 'Elijah Blue' are airy and beautiful. Not usually a long-lived grass, but stunning in the right location. 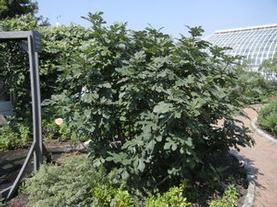 'Chicago Hardy' Fig has proven to be reliable as far north as Chicago with some protection, so it is an excellent choice for the Mid-Atlantic area. It is thought to be originally named 'Bensonhurst Purple', and the fruit is sweet and green with a light brownish-purple blush. Without any protection it will periodically die to the ground but will come back reliably. With winter protection, you get fruit production much earlier in the summer. The foliage is large, dramatic and subtly fragrant. The bright pink, Astilbe-like flowers of Queen of the Prairie bloom on tall stems in June and July. 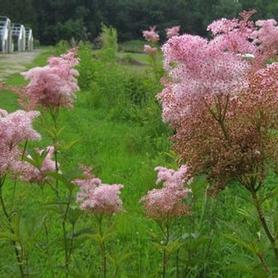 Filipendula ‘Venusta’ loves wet spots and will colonize a large area slowly. 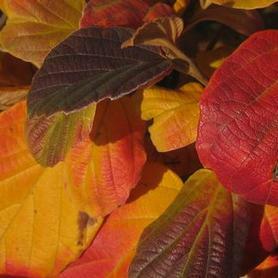 Dwarf Fothergilla has white fragrant bottlebrush flowers in April and May and its fall foliage is yellow, orange and red. It is wet site tolerant, but also does well in dryer woodland sites. 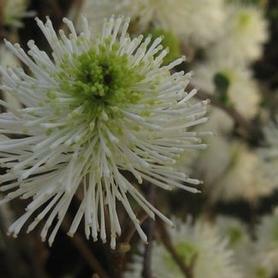 Fothergilla gardenii 'Suzanne' is a compact form of Dwarf Fothergilla from Dr. Michael Dirr, with beautiful white fragrant flowers in April and May, followed by lovely orange-red fall color. Named after his youngest daughter. PRN Prefered: A true dwarf selection, amazing fall color. 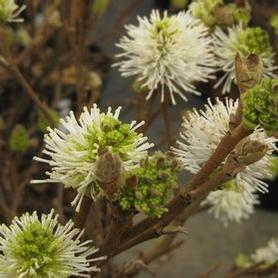 'Blue Shadow' Fothergilla has honey-scented white bottlebrush flowers in April and May, followed by dusty blue foliage. Fall color is a beautiful combination of yellow, orange and red. A selection by Gary Handy of Handy Nursery in Oregon. 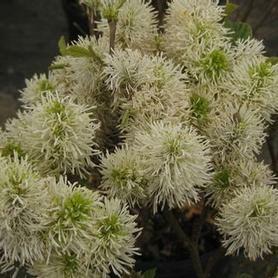 'Mount Airy' Fothergilla has fragrant white bottlebush flowers in April and May and boasts yellow, orange and red fall foliage. Selected by Dr. Michael Dirr at the Mount Airy Arboretum. 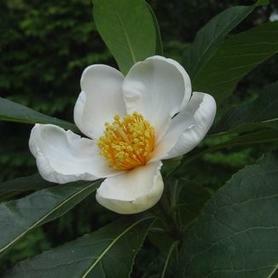 The Franklin Tree has white Camellia-like flowers in summer with striking red fall foliage. Franklinia alatamaha needs good organic matter and constant moisture in its planting location. Ours are from seed rather than cuttings and our experience is that Franklinias have more vigor and disease resistance when grown from seed. Sweet Woodruff has fragrant white flowers in spring over delicate, fragrant leaves and stems that release their odor when crushed. 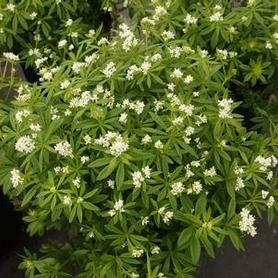 Galium odoratum has a slow creeping habit, and benefits from a summer cutback. 'Kleim's Hardy' Cape Jasmine has large single white extremely fragrant flowers in July and August. 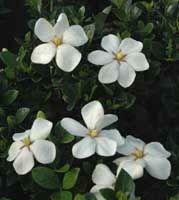 Gardenia jasminoides 'Kleim's Hardy' has rounded glossy green foliage and is semi-evergreen. This plant needs a sheltered spot. Creeping Wintergreen is an evergreen groundcover that thrives in wooded, well drained locations. 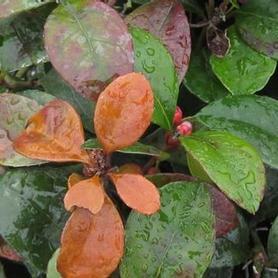 Gaultheria procumbens prefers acidic soils. The delicate pink and white bells appear on the stems in early to mid summer and are followed by small red fruit in the fall (much loved by small woodland critters). The leaves when crushed have the lovely scent of wintergreen. 'Siskiyou Pink' Wandflower has rose-pink delicate flowers that are suspended over the bronzy-green foliage, June through October. This may not be the longest-lived perennial, but the flower output makes it well worth planting. An introduction from Siskiyou Nursery in Washington State. Cut back when planting to rosette for winter survival. Needs good drainage to overwinter. 'Whirling Butterflies' Wandflower has delicate white flowers that hover over the green foliage all summer, from June to October. Cut back when planting to rosette for winter survival. Needs good drainage to over-winter, and prefers alkaline soils. 'True Blue' Gentian has large upward-facing cobalt blue flowers on sturdy stems. 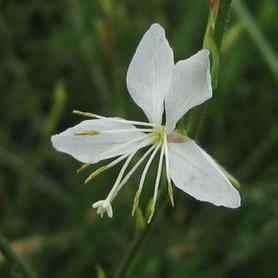 It blooms in August and September, and does well in average soils. 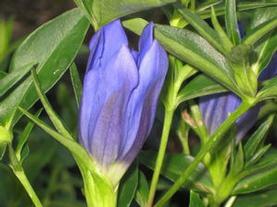 Gentiana 'True Blue' comes from the hybridizing work of Darrell Probst. 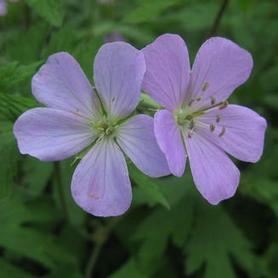 'Ingwersen's Variety' Bigroot Cranesbill is a wonderful garden Geranium with pale pink flowers in spring and early summer. 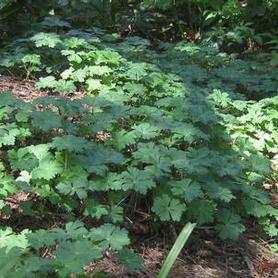 Leaves have classic Geranium odor. Found by English plantsman, Walter Ingwersen. More heat and shade tolerant than many species. Can be used as a groundcover. Spotted Cranesbill has deeply incised green leaves in a mounding habit. The flowers are produced in quantity from late April into June, in shades varying from pale pink to bright lavender-purple. As a native species of Geranium, it naturalizes well from seed in moist locations in both sun and shade. It is particularly effective as a loose woodland groundcover, especially when partnered with early spring bulbs, Ferns and Carex. This is one of Landscape Architect Larry Weaner's staples for his extensive work with natural meadows and woodlands. PRN Preferred: A "must have" for a woodland garden, spreads moderately by seed. 'Espresso' Spotted Cranesbill has lavender-pink flowers over beautiful red-brown foliage that ages to bronze-green by late summer. A North Creek Nurseries introduction, found in Landenberg, PA. 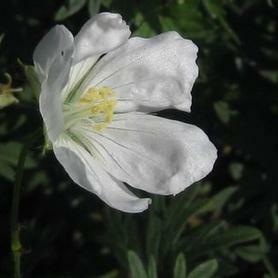 The clear white flowers of White Bloody Cranesbill appear in May and June over semi-evergreen foliage. It has good reddish fall color, and makes an attractive groundcover. 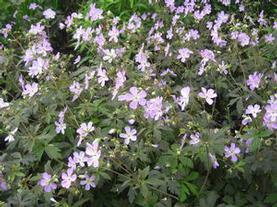 'Max Frei' Bloody Cranesbill has pinkish purple flowers in May and June, followed by good reddish fall color. Semi-evergreen, and a good low-growing groundcover. PRN Preferred: Dense foliage makes this a good low groundcover. 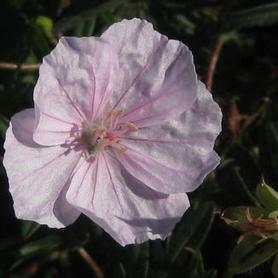 Striped Bloody Cranesbill has light pink flowers in May and June, with good reddish fall color. Semi-evergreen, and a good shade groundcover. 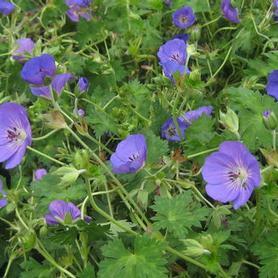 'Rozanne' ('Gerwat') Cranesbill has large blue-purple flowers with pale blue centers. It has a somewhat sprawling habit. This Geranium blooms all summer! A Blooms of Bressingham® selection found in England. 2008 Perennial Plant of the Year. 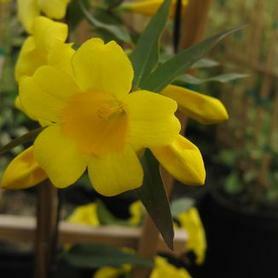 PRN Preferred: Tremendously long bloom period, great choice for scrambling up and throught other plants. 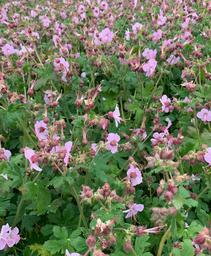 'Biokovo' Cambridge Geranium is a charming semi-evergreen groundcover which thrives in well drained sunny locations. The white blooms are tinged with pink at the base of the petals and are enhanced by red calyces. 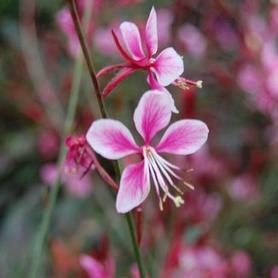 The flowers are produced in June and July, and hover gracefully over the low green foliage. The fall and winter color is also attractive, turning shades of bronze and red. 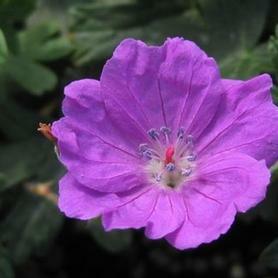 Geranium 'Biokovo' was a natural hybrid found in the Biokovo Mountains of Croatia, so its cold tolerance is excellent. 2015 Perennial Plant of the Year. 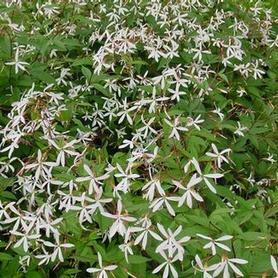 Bowman's Root is covered with delicate floating masses of white flowers from May to July. The new foliage emerges in bronzy tones turning to green throughout the summer. Although it is happiest in cool moist sites, it tolerates dryer conditions when established. In sunnier locations the fall color can be spectacular maroon-red. The name debate continues, with some voting for "Porteranthus trifoliatus".